O American Churchianity, which killest (reject) the prophets, and stonest them that are sent unto thee. 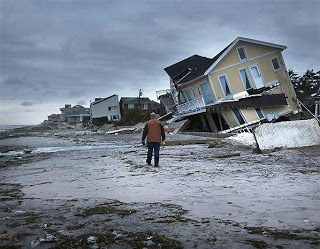 When I think about Superstorm Sandy and the destruction of New York City and other parts of the eastern seaboard this past week, I can’t help but think about a Christian I met in Nebraska back in 2008. His name was LaVerle [Van Houten] and he picked me up hitchhiking three times in one month (“in the mouth of two or three witnesses let every word be established”–so LaVerle’s picking me up three times in one month means something). LaVerle worked in western Nebraska and, on his days off, he would use his own money and fly to New York City and do street ministry. One of his last times in NYC, he met these two prophets. They told LaVerle that they were pulling out of New York because people weren’t repenting of their sin. In my travels, I would have to say that New York City, San Francisco and Las Vegas are probably the most secular, Godless cities in the United States. Superstorm Sandy was the Lord’s judgment on a wicked city (NYC). Years ago, I was hitchhiking through Tennessee and these two Christians picked me up and took me to Nashville. They let me stay overnight at their place. They took me to a restaurant for supper. I looked at him and didn’t say anything. How many Christian churches are in New York City? How many people in New York City are surrendered to the Lord Jesus Christ? For it cannot be that a prophet perish out of American Churchianity. God Hates Us, but . . .
Me and my husband also escaped NYC. You could see the writing on the wall. So many people can’t see because sin has blinded them. I have hitchhiked through northern Arizona a number of times. I think it would be a good place to live.